In the early 1970s, a bunch of films went looking for America. None of them arrived at a common destination. Inspired by the unexpected success of 1969’s Easy Rider, many more movies started exploring the backroads, byways, and otherwise-overlooked pockets of the United States. Not all were as philosophically inclined as their inspiration. For some, the road and the little places dotting it served as a refreshing change of scenery made possible by changing tastes. For one, the road itself became a subject, and a place of desire, dread, and ineffable dreams. “Two-Lane [Blacktop] doesn’t have a beginning or end,” screenwriter Rudy Wurlitzer observes on an audio commentary included on the Criterion Collection’s 2007 DVD (and later Blu-ray) release of the film. “It’s a straight throughline into the dream itself.” As odd a statement as that is for a screenwriter to make, given that the usual first task of the profession is to turn an idea into a structure, it suits a film more defined by its languors than its bursts of speed. A novelist whose only previous produced screenplay was the post-apocalyptic, Jim McBride-directed oddity Glen And Randa, Wurlitzer came on board when director Monte Hellman decided he liked the core idea of a screenplay by Will Corry—an actor inspired by a cross-country trip he’d taken—but not the screenplay itself. After starting to read Corry’s script but never finishing, Wurlitzer agreed. Together, Hellman and Wurlitzer took the idea of a cross-country race and stripped it to its essence, turning it into a contest between characters known only as The Driver and The Mechanic. The two men compete in drag races in a souped-up 1955 Chevy so utilitarian it doesn’t even have a coat of paint. Then they face a challenger referred to only by the name of the factory-fresh muscle car he drives: GTO. Also in the picture: a drifter known only as The Girl, who floats between all players. Hellman and Wurlitzer kept stripping this group down until even the story started to fall away. Not only does Two-Lane Blacktop reveal little about where its characters come from, it seems to forget where it’s going. Though declared a race “for pinks” that will leave the winner in possession of both cars, the contest frequently gets put on hold—and maybe forgotten—as the participants trade cars, help each other with repairs, share meals, and stop in mutually agreed-upon locations. The race is just an excuse created by people who know they need to keep moving. The film doesn’t share that instinct. It’s more inclined to sit and observe. 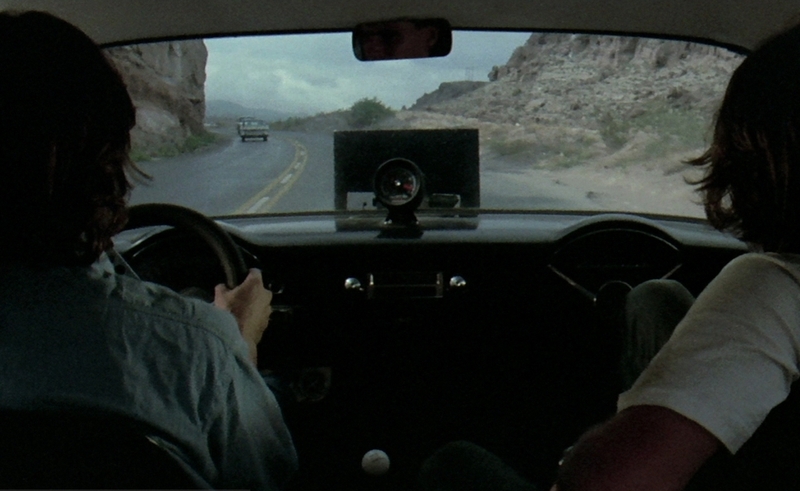 Two-Lane Blacktop’s terrain comes from Westerns, and its themes come from B-movies. But Hellman’s approach is European in inspiration. He shares Michelangelo Antonioni’s clear belief that staging figures moving across a frame, or watching others move, is its own kind of action, that characters can sometimes be better defined by their inability to express themselves, and that by drawing out the pace of the film, he can immerse viewers in his characters’ ennui. He also shares Godard’s fondness for disrupting the form of film itself, even if here, he mostly confines that instinct to Two-Lane’s final scene, in which the film appears to catch in the projector, then bubble and burn. That touch was Hellman’s idea, but it confirms Wurlitzer’s claims: There is no end to this movie. There’s no end to the road. It’s a way to escape that doubles as a trap. Hellman followed his own unlikely path to Two-Lane Blacktop. His time working for Roger Corman led to the creation of a the artful, low-budget Westerns Ride In The Whirlwind and The Shooting, but neither had earned much play in the United States, despite drawing respectful reviews abroad. That’s not the sort of résumé that usually earns a director a relatively robust budget from Universal Pictures and permission to shoot on locations spanning from Needles, California to Tennessee, but this wasn’t an era in which the usual rules applied. That was true of the casting, as well. For the role of GTO, Hellman turned to veteran character actor Warren Oates, having worked with him on The Shooting. Other major roles landed less conventional choices. Laurie Bird, whose life had parallels to The Girl’s, earned the part after Wurlitzer hired her as a research subject. For The Driver, Hellman brought in singer/songwriter James Taylor, whose breakthrough album Sweet Baby James appeared as Two-Lane Blacktop was in pre-production. As The Mechanic, Hellman cast, at the last minute, Beach Boys drummer Dennis Wilson. Of the four leads, only Oates qualifies as an actor, but the others’ inexperience, and sometimes visual discomfort, ends up serving the film. Taylor and Wilson play characters who only feel like themselves when working on, talking about, or driving cars. Away from them, The Driver retreats into a sulk, and though Wilson lets his big, handsome all-American face explode into the occasional smile, The Mechanic is only a little more expressive. Neither says much, and when they speak, they speak the language of cars. “You hear that, just a little flat spot there,” The Mechanic tells the driver on the road. “The centrifugal advance mechanism in the distributor might be fucked up.” The Driver says nothing. The Girl contributes only “I’m really hungry.” They can take care of the Chevy, but the human cargo gets less care. Wurlitzer picked up the language while researching the script, incorporating whatever he needed into the dialogue without attempting to provide context or an explanation. The whole movie is a bit like that. The Girl floats into the lives of The Driver and The Mechanic after abandoning her previous ride, a hippie who promised to show her the Grand Canyon, but just kept pulling over to get stoned. Told they’re going east, she replies, “That’s cool. I’ve never been east.” Her new companions come from California, or at least that’s what the plates on the Chevy suggest. Whether they’ve been east before remains an unanswered question. Or it would if anyone bothered to ask it. In retrospect, I was probably on the wrong side of that argument. 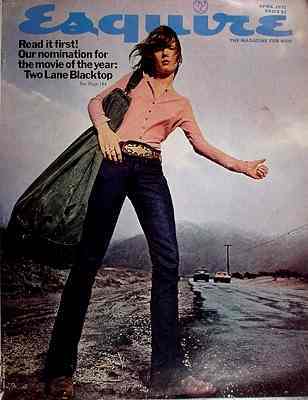 Despite earning the cover of Esquire’s April issue and the magazine’s endorsement as the “movie of the year,” Two-Lane Blacktop came and went quickly in 1971. Then it mostly vanished into Universal’s vault until it made a belated appearance on home video in the late 1990s, thanks to the efforts of a small but vocal cult. Chances are, Springsteen and Hellman were just drawing from some common sources: car culture, of course, but also the sadness of the moment when the things we do for kicks as kids start to turn into the things we do out of a desperate need to recapture those kicks as adults. Yet the Springsteen of Darkness is working in a romantic mode. The characters of “Racing In The Street” are still part of a cycle of sin and redemption. They can ride to the sea and wash the sins off their hands. The characters of Two-Lane Blacktop have lost such options. The Driver talks about going to Florida, and later, so does GTO, giving The Girl a spiel about getting healthy on a beach and letting “all the scars heal.” “If I’m not grounded pretty soon,” he tells her, “I’m going to go into orbit.” It’s a rare instance in which he talks about the future instead of the past. Maybe he even means it, but what makes Oates’ performance heartbreaking is the way he makes clear that this guy is already gone. As the film progresses, GTO’s passengers get increasingly vocal about death, a progression that suggests the movie might have a structure after all, whatever Wurlitzer’s claims. These include a grandmother taking her granddaughter the grave of the girls’ parents, who were killed recently by a “city car” and, prior to that, a hippie who may need a ride but has no use for GTO’s talk about racing cars. After all, death looms. “What do we have?” he says before being asked to get dropped off, “30, 40 years?” Maybe not even that: Bird died in 1979 at the age of 26, a suicide. Oates would die of a heart attack 11 years later at the age of 53. Wilson died one year later at the age of 39, drowning after a day of drinking. All that was ahead, of course, when the movie was released, but knowing it now just adds an extra layer to a film already haunted by death, one in which everyone keeps driving because they seemingly don’t know what else to do, following a road that has no beginning, no end, and too many places to get lost. Tune in on Thursday for the Movie Of The Week Forum, with Scott and Sam Adams deconstructing the road movie and musing over the film’s particular form of masculinity. Also on Thursday, Sam looks at the way that masculinity traps the characters and makes them rootless ciphers.